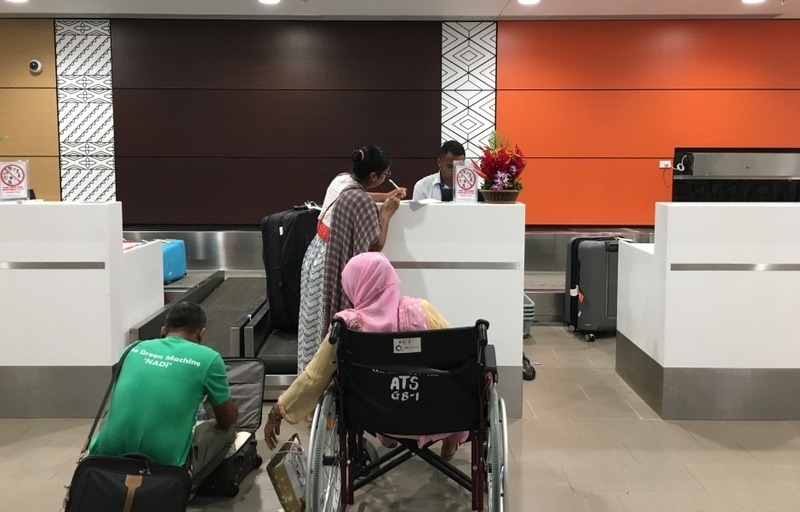 This review of Fiji Airways Lounge at Nadi Airport is of the temporary lounge, while Fiji Airways readies their new Tabua Club Lounge. Our entrance to the lounge was delayed by a lengthy check-in process, even though we were flying business class. As an experiment, my husband waited in the Economy Class line, and actually got to a check-in agent faster than I did waiting in the business class line, where I waited 20 minutes behind some passengers who were filling out all kinds of forms. I would have expected another check-in agent to handle Business Class passengers given the long wait, but that didn't happen. The business class passengers behind us were just as frustrated. Normally we wouldn't have had to wait in line as we rarely check a bag, but my son and I had been abroad for over a month and my son and husband had over a week more of travel before heading home, so we had enough luggage that we had to check a bag. Visiting Fiji? The best luxury resort by far is Laucala Island, a private island resort that is a 1 hour private flight from Nadi. You'd have access to the Laucala Lounge, a far more private lounge than the Fiji Airways Tabua Club Lounge. The reception is on the left after entering the lounge, and is where you'll present your boarding pass, and, if you're using Priority Pass, your Priority Pass card. If wanting to access WiFi, you'll need to take a paper slip with the WiFi password. WiFi was quite slow, perhaps due to the number of passengers in the lounge, and I gave up doing anything other than email. The temporary lounge squeezes many armchairs into the one big room, and while this photo was taken after everyone had exited the lounge for our flight, when we arrived the lounge was quite crowded. There's a TV nook, although no one was watching TV for our visit–nearly everyone was on their phone or tablet. At the back of the room is the buffet. Note that the temporary lounge doesn't have a bathroom inside the lounge; presumably the new lounge will have a bathroom and shower inside the lounge, as the old one did. 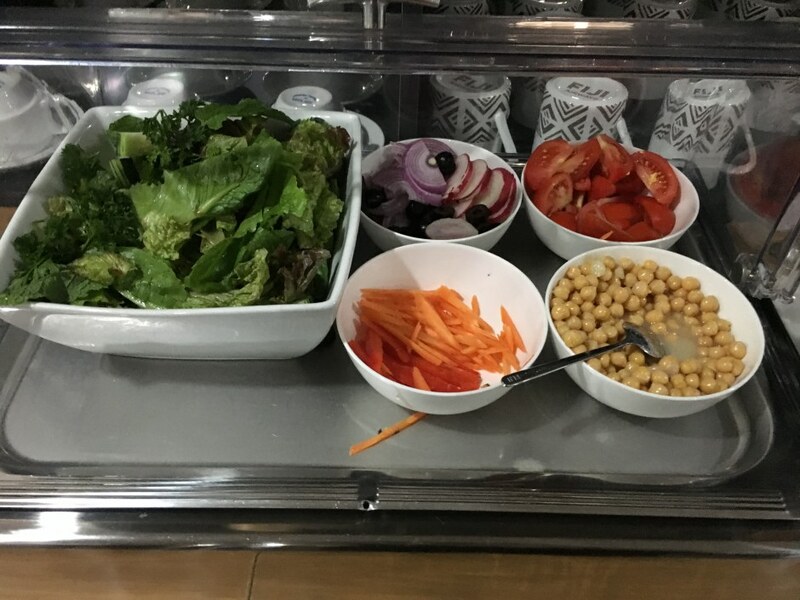 There were a decent number of options on the buffet given the small lounge size. Among the more appetizing was the salad, which was quite fresh. Some pakora with coriander yogurt sauce were available, and the mint and coriander yogurt sauce was tasty. My husband, who was hungry, had some chicken and rice, which he said was good, for lounge food. 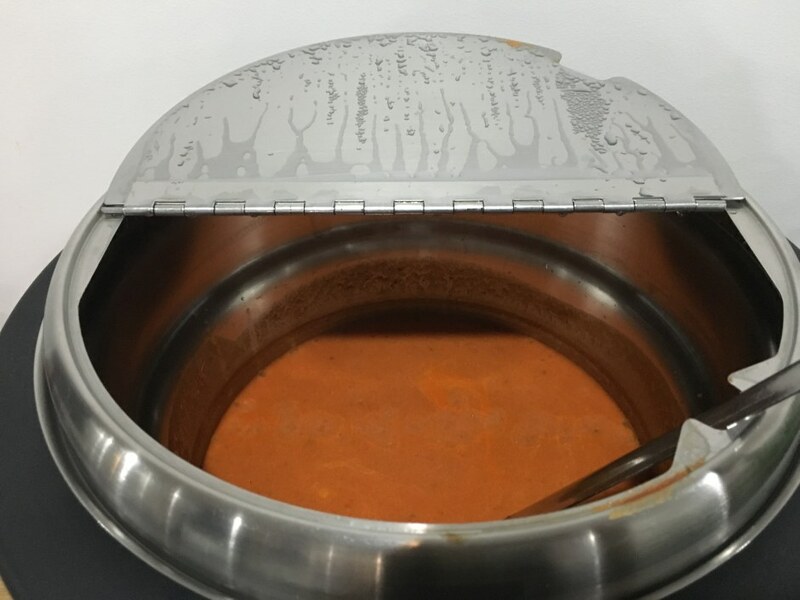 Although it didn't look very appetizing, my son had a little of the lasagne, which he liked, although he said our lasagne at home is better and not as greasy. 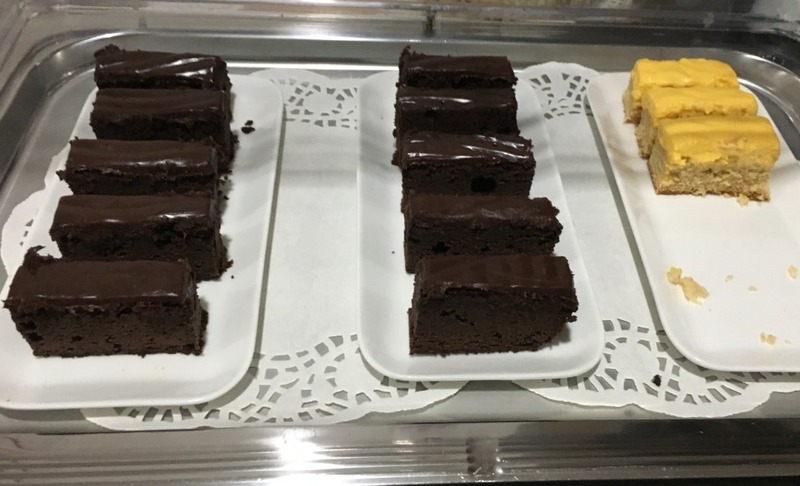 There were also bread rolls, a roasted red pepper soup, and chocolate cake for dessert, that we didn't try. 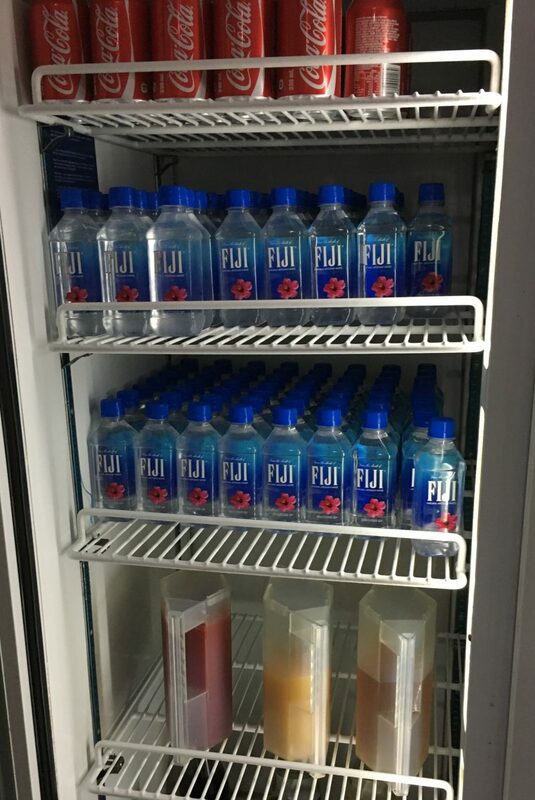 Cold drinks were in refrigerated compartments, and included Fiji Water (naturally), Coca Cola, juices, a cheap New Zealand Sauvignon Blanc (Totara Bay) and Charton Brut sparkling wine. Since the espresso machine had the warning “Cleaning Necessary” I didn't see anyone using it. There was some brewed coffee and hot water for tea, with Dilmah tea bags provided. 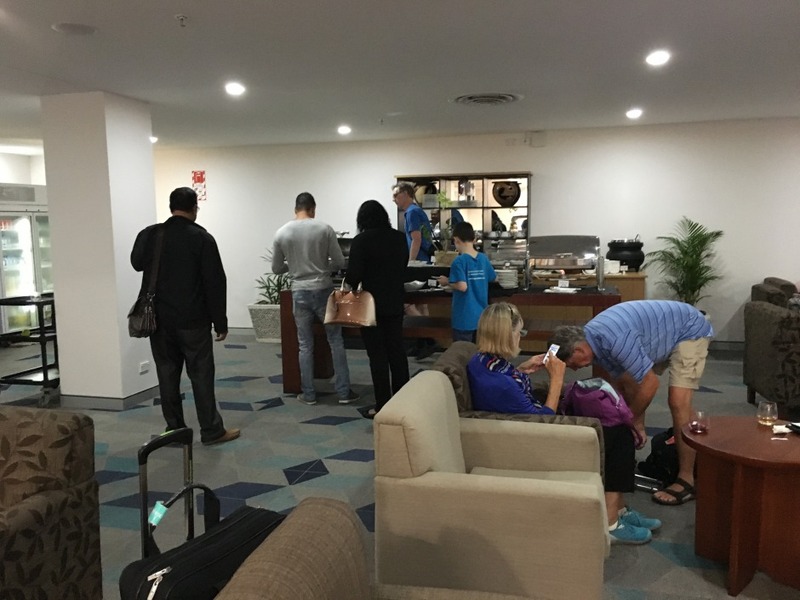 The current Fiji Airways lounge is a temporary lounge in a windowless room, and can get quite crowded, so it's nothing worth getting to Nadi Airport too early for. 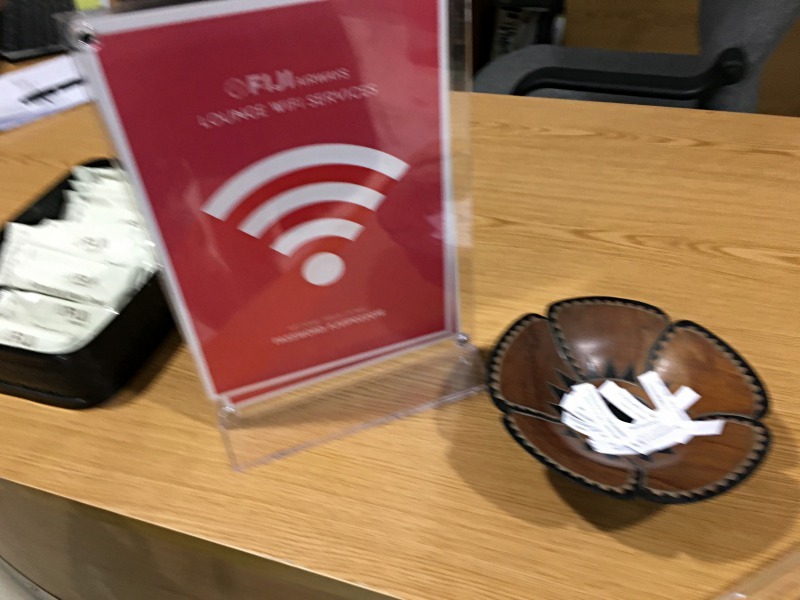 Apparently Fiji Airways is now providing access, for LAX departing passengers, to the oneworld business class lounge in TBIT at LAX, so the Tabua Lounge is a very far cry from this. I just hope that the new Tabua Club Lounge will have more power outlets, better WiFi, and its own bathroom and shower room. Become a TravelSort Client and Book Your Luxury Hotel with Virtuoso or Preferred Partner Benefits!